Kataru's love and pursuit of Farming: What exactly is evapotranspiration? "Evapo what?." That's my reaction when I first heard that word. Simply put, it is the amount of water vapor released into atmosphere by soil and plants on any given day. Evaporation: On average, water is evaporated across the earth's surface at the rate of 1/8th inch each day. At tropics, more evaporation occurs. At cooler areas, less so. 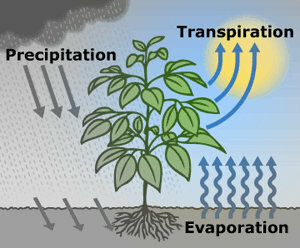 Transpiration: Transpiration is vaporization of the liquid water in the plant. Plants have small openings (called "stoma") in the underside of leaves that release water vapor into atmosphere. Read my previous post for more info on this. If the crop is smaller (like strawberries), water is predominantly lost by the soil evaporation. If the crop is alfalfa or well-developed almond orchard with full canopy, then transpiration becomes the main component of evapotranspiration.